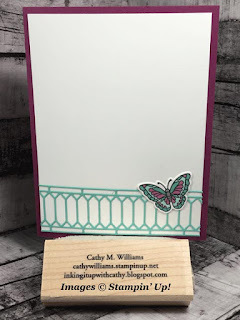 I saw this cute spinner card that another demonstrator posted on the Facebook Demonstrator Planning Place group but for the life of me, I can't find it. 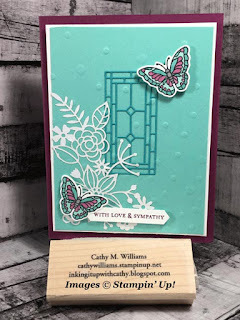 I love revisiting old techniques and card types, don't you? Here, I made a spinning wheel card which spins around to show "celebrate", a cupcake, "enjoy!" and a party hat. Check out my video to see how easy it is to make this card. Are you looking forward to the new 2019-2020 Annual Catalog as much as I am? Having attended the OnStage event, I was able to get a copy of it and it is awesome! The best part of attending OnStage (with exception to seeing my friends from all over the country) is the ability to get the catalog early and see the cool products that are coming in June. The second thing about attending OnStage is getting to order some of those products right away and today I am sharing them with you. The video is a bit long but I wanted to show you all the cool things that I ordered and give you a sneak peek at what is on its' way. You won't be able to order these products until June 4 but visit my Online Store here to order any of the retiring items including the 2017-2019 In Colors. 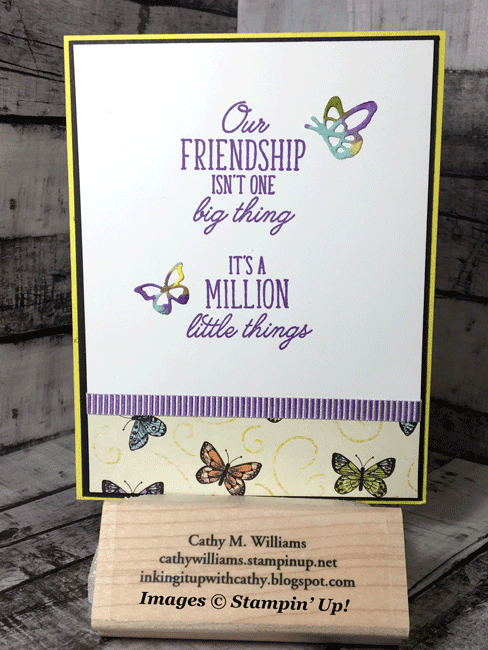 Every Sale-A-Bration, Stampin' Up! comes up with an adorable set using some sort of animal. Do you remember last year's pandas or 2017's chickens from Hey Chick? 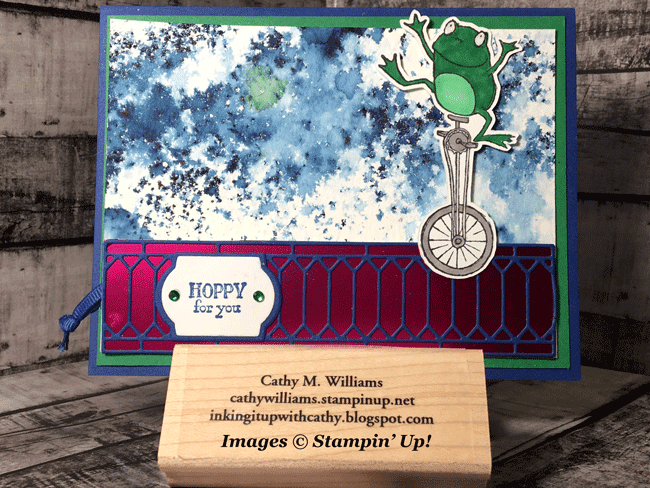 This year it is So Hoppy for You with the cutest little frogs. How can you not love a frog on a unicycle, right? Ok, so now So Hoppy for You is on your wish list but you also HAVE TO ADD the Grapefruit Grove and Lovely Lipstick Foil Sheets as well. The picture in the catalog absolutely does not do them justice! Of course, neither do these pictures. Hopefully, you will get a better look at them in the video below. On this card I used Brusho powders for the background and created a pull tab to allow the frog to cycle his way over to the left side of the card. 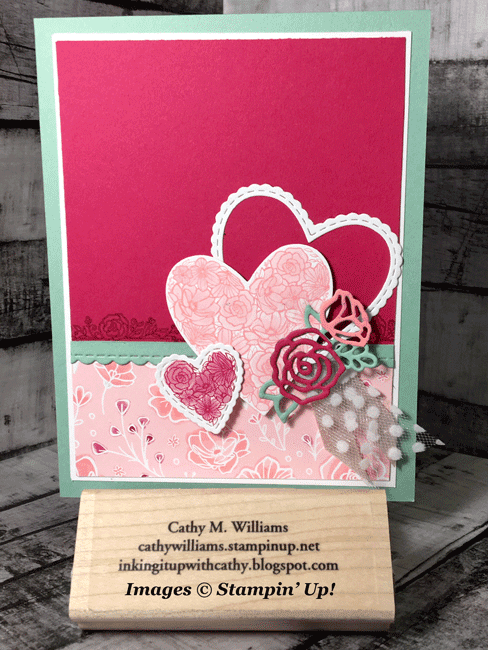 Check out the video on how to make this card - it is actually easier than you think! 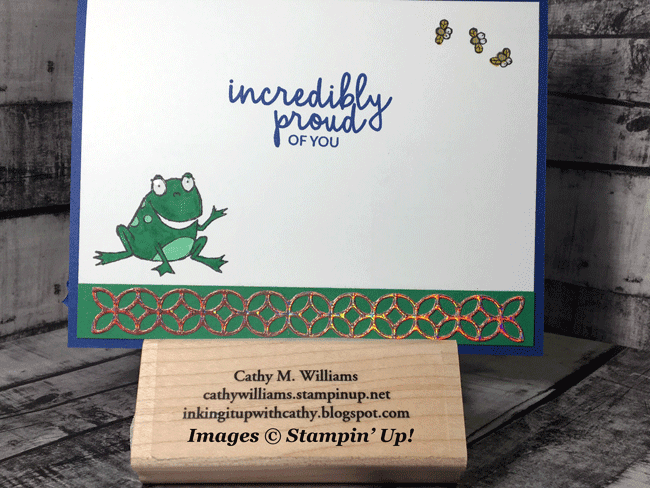 On the inside of the card, I used the Incredible Like You stamp set. At the bottom is the Grapefruit Grove foil sheet which is holographic and so very cool! Here you can see how the frog has moved across the card using the side pull tab. When I attended Stampin' Up! 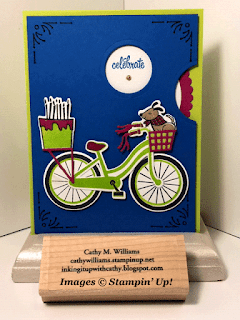 's OnStage, I won the Beauty Abounds stamp set as my prize patrol. 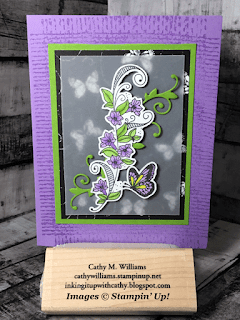 I immediately fell in love with the floral flourish in the stamp set. While I love the butterfly dies that coordinate with this set, it does not include a die to cut out the flourish so I created my own cut file on my ScanNCut. After cutting it out, I colored it using the Highland Heather and Granny Apple Green Blends markers. The black & white butterfly paper behind the vellum is from the Botanical Butterfly Sale-A-Bration paper. On the inside of the card, I used another piece from the same paper. I just love this paper! 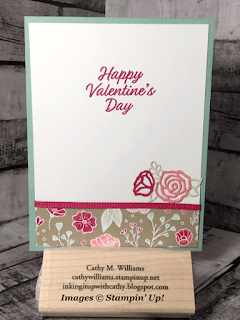 Here's a tip for you - when attaching something like the stamped flourish over a piece of vellum and then attaching the vellum to your card front, place your Dimensionals on the backside of the vellum in exactly the same places as on the front to hold the flourish. This way the adhesive is completely hidden. For those of you who are curious how I created my own cut file, here are the steps I took - yes it is a bit convoluted but it worked great. First I stamped the image in Memento black and ran it through my ScanNCut to scan the image in. I added a .04 matting around the outside. I cut the image out to make sure that it looks exactly the way I wanted it and then slide a piece of black paper into the same location on my mat and cut it out again in black. I then took the black piece and scanned it into the machine and saved it as a cut file. 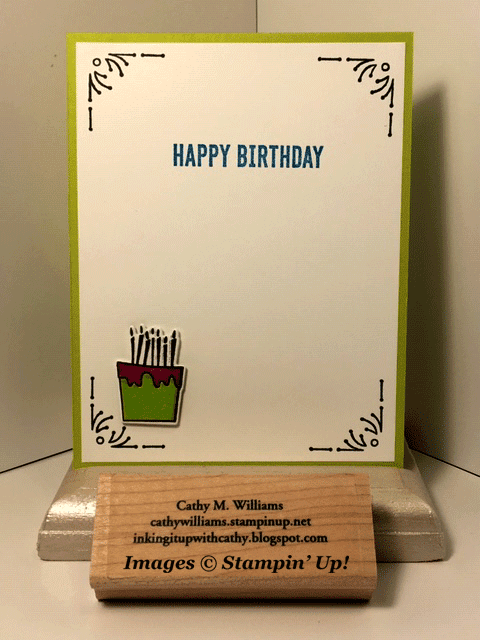 I then took a piece of the white backing from the designer series papers (thin chipboard) and cut it out using the saved cut file to create a template. I then cut out a bunch of the cut files from a piece of Whisper White. 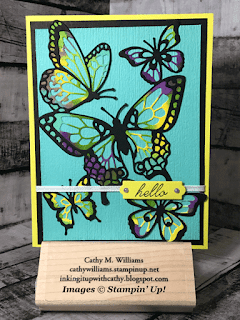 I placed the template in my Stamparatus and placed my stamp in the cut out area of the template and picked it up with the plate. 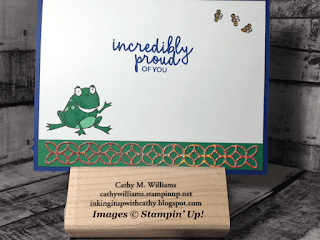 Then I could place each of the cut flourishes into the template area, ink the stamp and stamp them! If that doesn't make sense to you, send me an email and I will do a quick video to show the process. 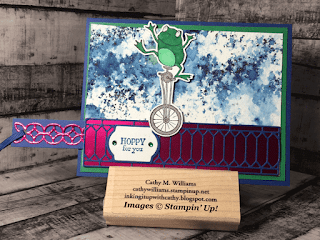 The new Occasions catalog is live and it is the best time of the year for Stampin' Up! - it is Sale-A-Bration! If you don't know what Sale-A-Bration is, from now until March 31 for every $50 in merchadise that you purchase, you can select an item from the exclusive Sale-A-Bration catalog for free. We all love free, right? Today's card uses items from the new Occasions catalog and also the Sale-A-Bration catalog. 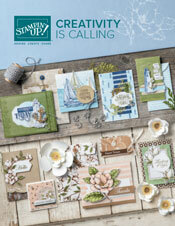 I received the Botanical Butterfly Designer Series Paper free with $50 in product. 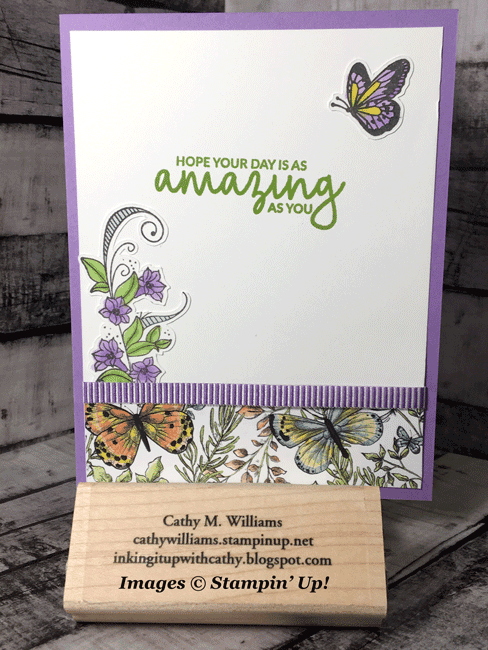 The stamp set used in the card is Beauty Abounds and the butterflies are cut with the coordinating dies. 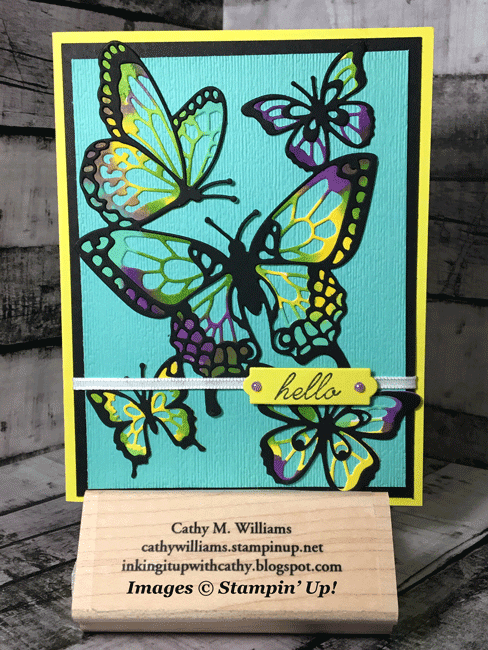 In the video below, I show how I made the colorful butterflies on the front of the card. It is a super easy technique but very pretty. One tip for you - make sure to place the double sided adhesive sheets on the back of your cardstock prior to cutting your butterflies. Since they are so detailed, it is much easier to put them together with the adhesive already on them. Also when putting the top butterfly piece (black) onto the other, start with placing the center butterfly and then adjust the other butterflies individually.